Contact Stephen McParland by e-mail at cmusic@hotkey.net.au. Description: This is the first of a two-volume set documenting the recording careers of Jan & Dean, based on interviews with many of their friends and fellow musicians, including P. F. Sloan. Volume 1 covers the years 1958 - 1964. Volume 2, featuring a full discography, is due out soon. 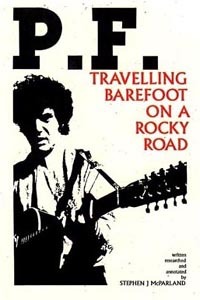 Review: P. F. Sloan contributed extensively to these two volumes as an interviewee, and had considerable influence as a performer, writer and singer on the duo. Of particular interest are Chapters 7 ("Tell 'Em We're Surfin'"), 8 ("Here They Come - All Over The Place") and 9 ("You Won't Believe We're On The Eve of Destruction"). 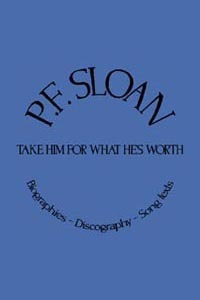 Description: Subtitled "The Musical Biography of P. F. Sloan", this eagerly-awaited book is finally ready! Originally having the working title "Take Me For What I'm Worth", it has been retitled "P.F. - Travelling Barefoot on a Rocky Road". The account of one of the most interesting figures in the world of modern music has until now only been sketchily documented, with the result that the few interviews available usually cover similar ground. This book covers the whole of his life right up to the present day, from his early days in New York, through his days in Los Angeles in the mid-1960s at Dunhill Records, the reclusive period in the 1970s, his re-emergence in the 1980s, and his continuing devotion to music in the 1990s, a hugely creative and inspirational force, as anyone who has seen his recent concerts will attest. The book itself contains 18 chapters covering approximately 280 pages! Following this is an exhaustive discography, covering various aspects of his work, such as singer, songwriter, session musician, producer, and so on. Several photographs are included. Review: If you have read any of Stephen McParland's previous works, such as "The Wilson Project", you will be aware of the care and attention to detail which he devotes to his subjects. Stephen has known P. F. Sloan for many years, and this book is the result of numerous interviews with both P. F. Sloan himself, and the people whose lives he has been associated with. In short, this book is a must-read. Other works: Stephen has wriiten a book about the Beach Boys called "Our Favourite Sessions". 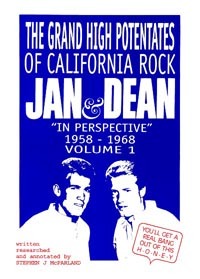 It is 180 pages long, and covers various recording sessions from 1961-1970, including a thorough investigation of the group's first few months together, some new facts having been unearthed.Also due out from the prolific Stephen in 2000 are a biography of Jan & Dean, and a 5-volume book devoted to Gary Usher. Contact him for further information about the availability of these titles. Contact Rob Kopp at koppr@worldonline.nl for payment and shipping details. Description: Subtitled "Biography - Discography - Lyrics", this is a 200-page "scrapbook-style" collection of articles, photographs, together with the most comprehensive discography that has yet been published. There are many photographs of picture sleeves from a variety of countries, and a huge number of lyrics, of both released and unreleased songs. Review: This, the first major book to be published about P. F. Sloan, filled a huge void. Whereas Stephen McParland's book tends to be more narrative, this book focuses on the records themselves. Rob Kopp has amassed a huge amount of Sloan-related material, with many unusual picture sleeves, the most interesting ones being presented in colour. The lyrics are very accurate and comprehensive, featuring songs that have yet to receive an official release. Unfortunately the binding of my copy seems to be falling off... but maybe that's just because I've been looking at it so much! Other works: Rob has also produced a booklet about The Kinks, "Down All The Days". Contact him for more details.